Is there any current limits on this. There are not any listed in the datasheet. My appliction might require about 6 amps at 12v and I would like to know if this would work. 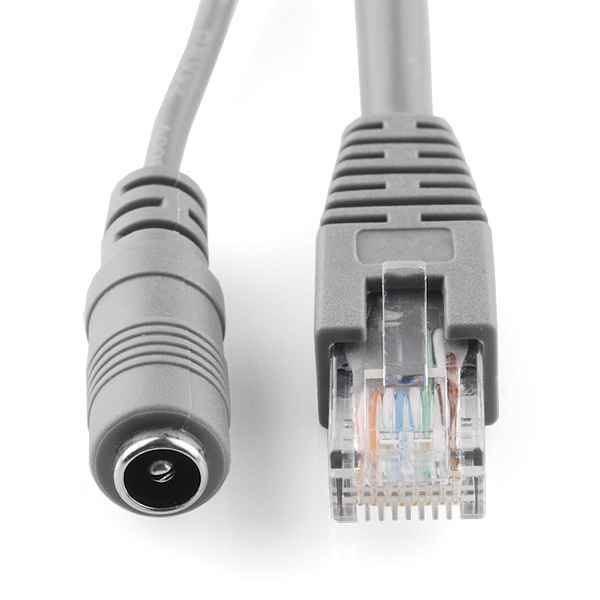 I think the most limiting factor would be the length and AWG of the Ethernet cable you connect between the two end points. you can plug all 6 ends together to make an infinite loop! We've confirmed that this works perfectly with a Dlink DAP-1522 access point, using the power supply that came with the AP at the switch end. Outstanding! $5 and we have just effectively turned a cheap AP into a PoE AP. The only downside is not being able to use the PoE ports in our switch, but this is the next best thing! We now have a Dlink DCS-932L web camera on the way to try this out with. From the pictures, it looks like it has the same 2.1mm coaxial power jack, so it should work perfectly. I'm using these to power a 8 port D-Link switch next to my home's patch pannel, it's in a closet i don't have power in yet. the run might be 35-40 ft. and i'm using it's original power supply. seems most smaller switches, routers, arduino devices are great for these. Not good for PoE IP cameras. Tried using it for the D-link DCS-930L. Anything over 10ft and the camera didn't have enough power to get the cameras CCU working. So if this is your intention, it wont work. We're going to give it a try with the DCS-932L and see if we have any luck. Did you check the connectors for poor crimp, causing the voltage drop? So... would I need this to power an Arduino with an Ethernet With PoE shield? How much current can this support? This looks to be compatible with supplying power to the Arduino Ethernet Shield but you have to buy a Silvertel PoE Module AG9120S and solder it to the board. Yes it is a 12v module but with a bridge already installed on the Ethernet Shield from V+ to ADJ it supplies 9v to the Arduino so you don't have to use the far end adapter to supply power. Just thought some would want to know happy building! There's no need buy that module. The item on this page is two cables. One with a "power in" barrel jack, and one for the other side with a "power out" barrel plug. Notice the last picture in the series. 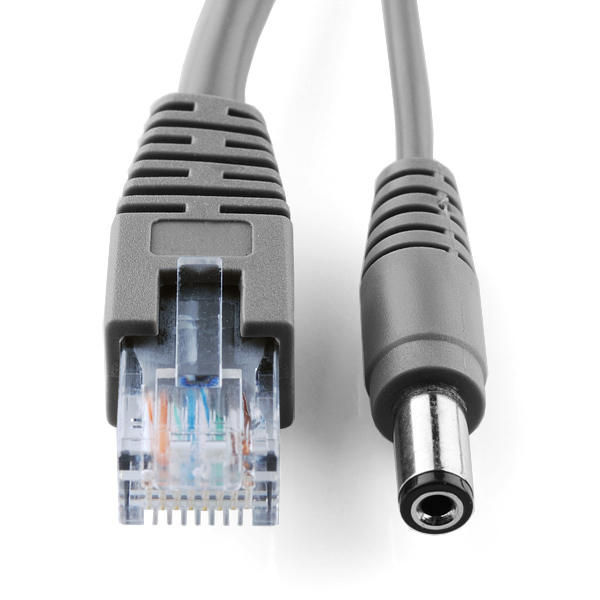 The cable splits power back out before plugging into your device, so you don't need to have a POE capable device at all. Not true if you don't want to have to use a wall outlet. 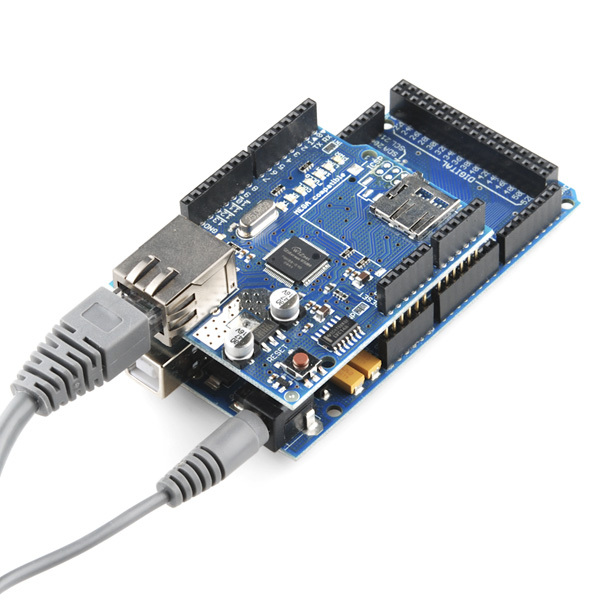 Using an Arduino Mega 2560 and Arduino Etherenet Shield R3 connected to a Cisco 48 port POE switch, the cable will not split power from the ethernet. Probably because it doesn't send power unless it's connected to a POE ready device (like the module mentioned). In essence, this is a POE injector (minus a power cable) and splitter. I wish you had one with a regular 6 pin telephone jack. It would be great on my cordless phone base. 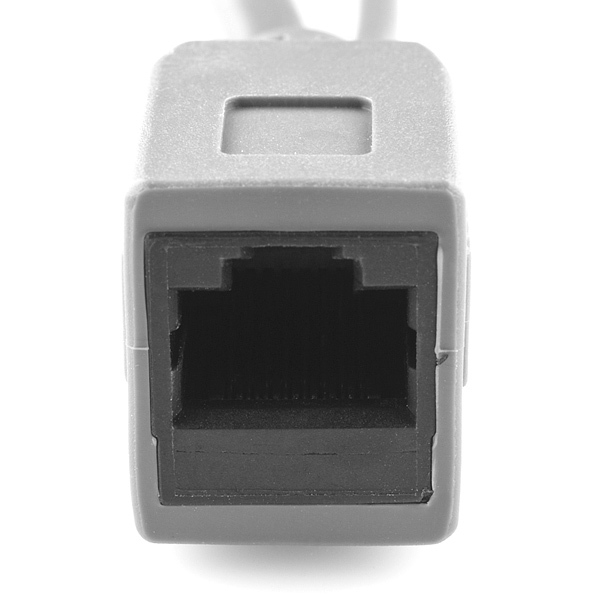 Just make your own phone->RJ45 cables. 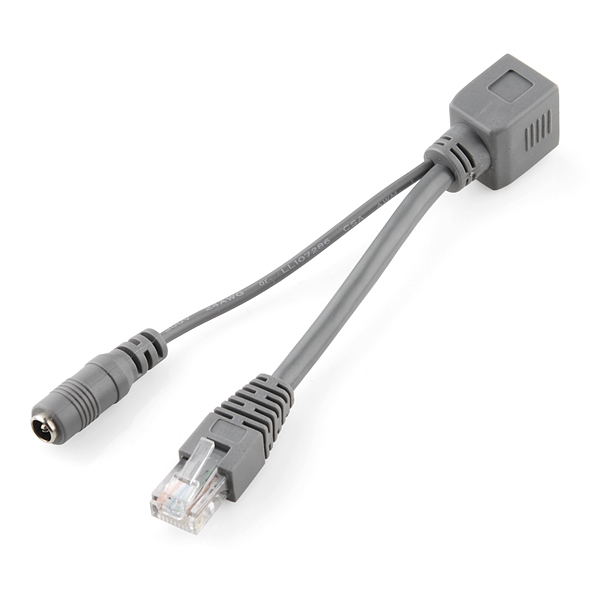 Aren't standard phones only a single pair on an RJ11 connector? Just a note: this appears to not actually be an 802.3af power source, but rather a passive supply. So, if your project actually requires real negotiated 802.3af (some embedded boards, some routers, etc), you may want to check that this will work for you. I found what looks like a pretty straightforward 802.3af injector AN3507 from Maxim that uses a MAX5922A still looking for a simple splitter thou. No, these cables follow the generally accepted passive PoE standard of putting ground on pins 7&8 and power on 4&5. Many active PoE implementations are designed to fall back to this passive method. Even units designed for the opposite polarity should (read: sometimes) have a bridge rectifier to make it irrelevant. The bigger potential problem is if your gear doesn't use the same 5.5x2.1mm jack that this does. 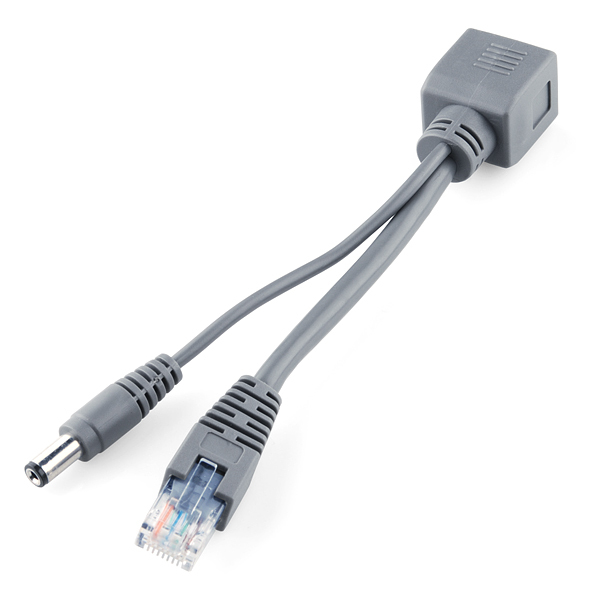 If there's room for improvement, it'd be a selection of the top few common connector sizes.